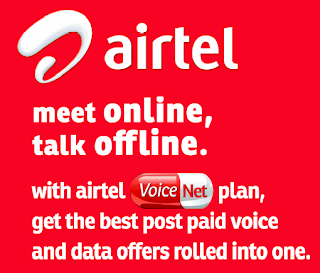 Airtel VOICE NET 3G postpaid plans comes at fixed monthly rental of Rs. 250 and Rs. 549. 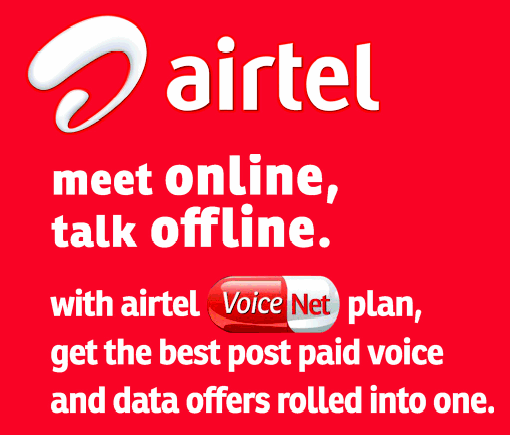 The VOICE NET Plan- 250 provides Free 250 minutes for Voice Calls to any local network, 250 Free Local/National SMS and 1 GB free 3G Data usage per month. While VOICE NET Plan-549 provides Free 549 minutes for Voice Calls to any local network, 200 Free Local/National SMS and 2 GB free 3G Data usage per month. Local and STD Call charges in both plans will be A2A-0.60 p/min and A2O-0.75 p/minute.